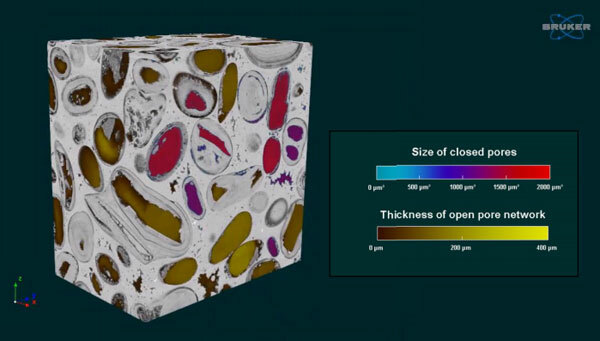 Micro-CT is a non-destructive 3D imaging and analysis technique, for studying the internal structure of all types of samples, with diameters from 1 mm to 20cm and full drill cores. Take virtual slices through objects and build stacks for 3D volume rendering. Left: 3D mineral distribution of gold deposits. Carbonate drill core (200 mm long ) with a section removed virtually. 3072 x 3072 x 9783 pixels; 13 µm isotropic resolution. 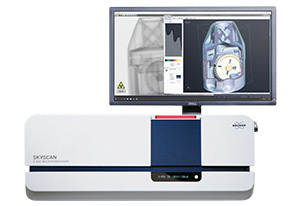 Scanned with the Bruker SkyScan 1273. 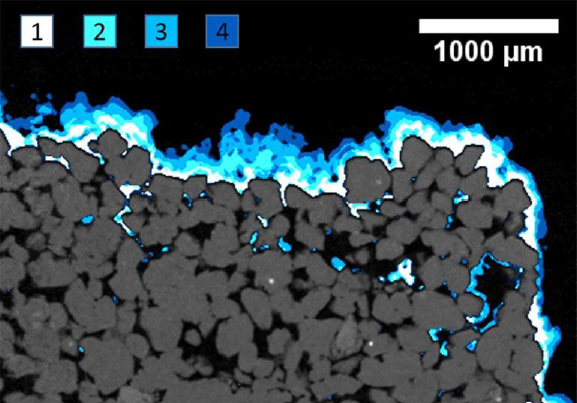 Analysing porosity: measure the size of closed pores and the thickness of open pore networks. Volume render of Bentheim sandstone with salt crust over half the sample. Volume rendering of Vosges sandstone. 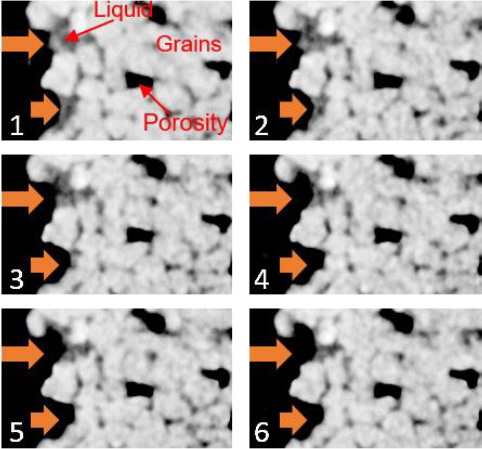 Connected pore space from top to bottom was selected using the primitive ROI and ROI shrink-wrap plug-ins. Colour-coded by local thickness. Scanned with the Bruker SkyScan 2214 nano-CT (1.10 μm image pixel size). ROIs are rarely regular, especially in rock samples. Bruker’s micro-CT software has powerful features for making selections and extracting the data you need. Image dynamic processes with step-by-step timelapse and in real time methods. This is known as 4D micro-CT. Extract and combine information from various length scales to quantify and model the overall sample behaviour. 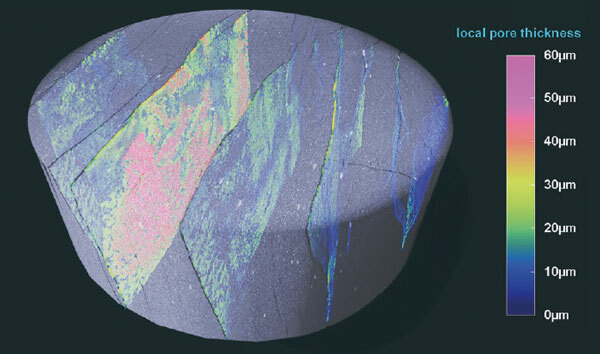 The data acquired from micro-CT adds value to other analytical techniques, including micro-XRF, XRDand optical/electron microscopy. 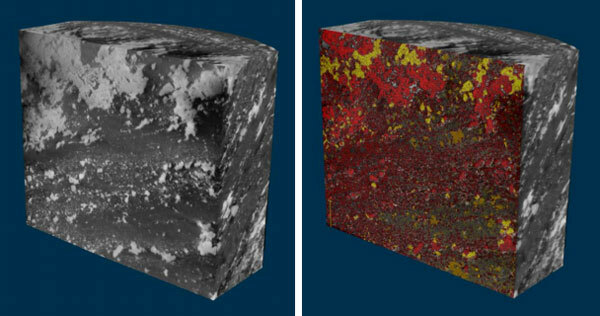 Data can be overlaid to create 3D mineral maps and more. 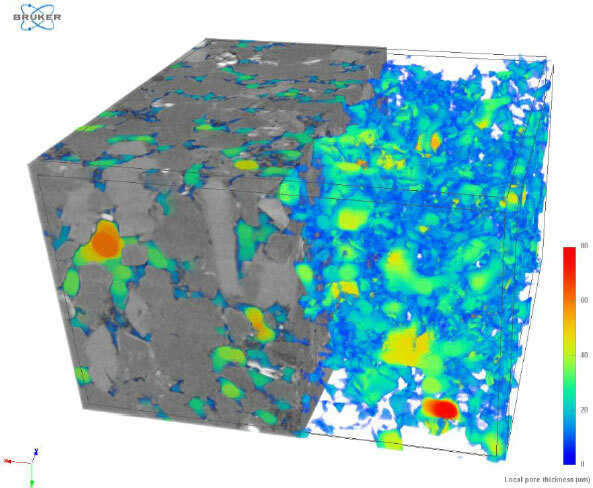 Drill core scanned with the Bruker SkyScan 1275 micro-CT and the Bruker M4 TORNADO micro-XRF to produce an element map. The data was overlaid for 3D alignment of both imaging modalities. 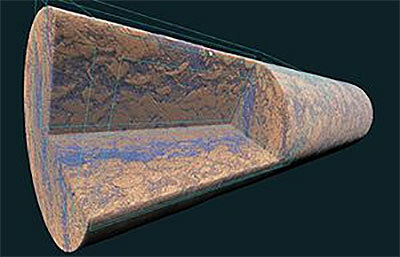 3D alignment of micro-CT and micro-XRF on a drill core. 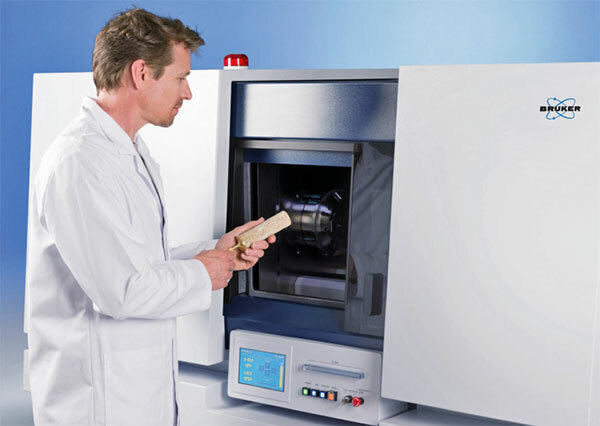 Watch a webinar from Bruker introducing micro-CT and its applications in geology and geoscience. Cross-section of Bentheim sandstone showing the evolution of the salt crust, in 4 cycles of saturation with salt liquid and drying at atmospheric conditions. 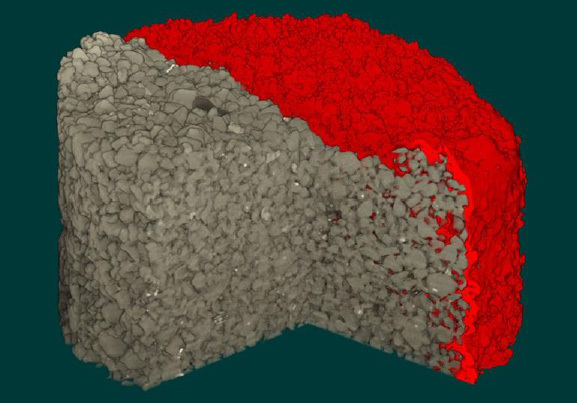 Shale scanned at 6.2 μm voxel size with the Bruker SkyScan 2214. Volume rendered 3D model with color coded local thickness of the pores. Helical scanning for clear, accurate reconstructions without artefacts. 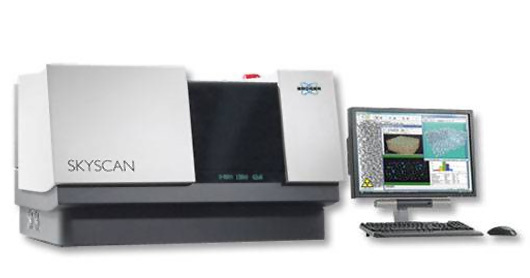 Scan large, heavy samples up to 500 mm length, 300 mm diameter and 20 kg weight. Until now, this was now possible using a benchtop scanner, and requires a larger floor-standing system. Automated, benchtop micro-CT with self-optimising features, so you can scan at the press of a button. 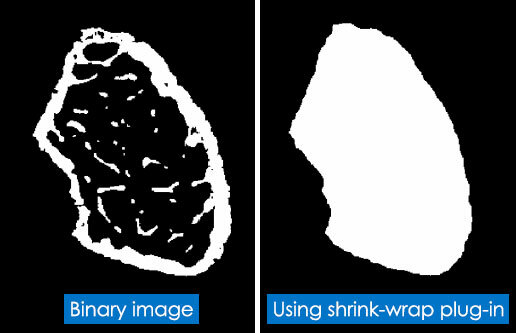 Extremely fast image reconstruction – a practical way to add micro-CT capabilities to your facility. Multiscale nano-/micro-CT covering the widest range of resolutions. Sub-micron resolution and the world’s fastest hierarchical 3D reconstruction.